What is different about today’s alliances is the non-traditional partners KM is playing with. KM programs doing the most interesting work and getting the most funding for it, are partnering with groups like “innovation,” digital disruption, and new ventures—all function with a license to experiment and the budget to do it. For example, large professional service firms tend to be early adopters and advocates of new technologies, and have the KM function on the team or as the focus of the project along with partnering teams. KM brings a unique set of skills and attributes that make the KM function an eager and natural partner in the digital transformation strategy and an important player in the AI game at this early stage of adoption. KM has always been a boundary-spanning function. KM’s mission is to capture, retain and share knowledge and enable collaboration especially across the silos that organization structures inherently promote. KM teams have good partnering skills such as facilitation, listening, and engagement skills to collaborate with diverse partners across the organization. 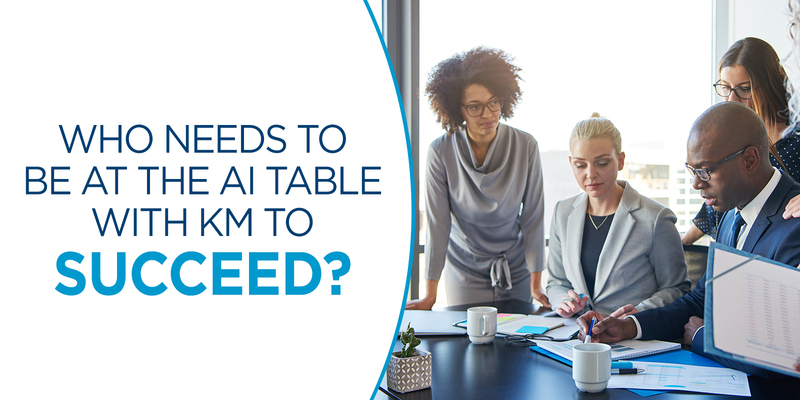 Enterprise-wide KM and innovation departments often uncover opportunities to test AI and RPA that others with more limited line of sight might miss. Large KM programs, short of staff or budget, are eager to use advanced technologies to enhance content management, recommendation systems, and expertise location system. PS firms are a great example of this. With constantly changing knowledge as a product, PS firms need the adaptability that AI and machine learning can provide, while replacing expensive or unavailable staff. KM is a master of bootstrapping projects with limited budgets to prove a business case. Lots of departments and players are interested in using AI and process automation but need affordable pilots and proof of concepts. Banding together provides both the business case and resources to pull it off. KM has excellent line of sight into users’ needs and behaviors. KM has a history of listening to and translating the end user and helping them cope with rapidly evolving processes, methodologies, and technologies. KM in turn benefits from the clout and skill sets alliance partners bring to the table. Technical Savvy—KM teams don’t need to be able to do coding or programming, but they need someone who is familiar with the language of technology, keeps up with the trends, and understands the potential technology solutions. Innovation Skills—Partnering with innovation and digital transformation teams helps KM stay on the forefront of as well as design thinking, agile thinking, systems thinking, and similar methodologies. Funding—Innovation and digital transformation centers of excellence have funding and visibility that KM alone may lack. In summary, the key to AI and other digital projects is to forge alliances that build and learn from experiments applying AI and machine learning. Digital transformation and silo-spanning AI and RPA projects are stronger and more successful with KM in the mix of allies. My advice to executives is: Increase your odds of success and recruit KM into your digital alliance.